Just need to press the button in the remote to modify the levels. How to turn on and off the remote transmitter? Press "1/2" button for 3 seconds to turn on/off the remote. ★【Unique Button Design】-Button can control 3 modes independent. Modify the shock and vibration level directly. There is a flashlight button on the side. It is very convenient to use in the day and night. ★【Safe & Humane Training Modes】-Training collar offer Static Shock (0-100 levels), Vibration(0-100 levels) and a standard "Beep" mode. You can choose the suitable level to training your dog. ★【1,850 ft Control Range】-The remote control reach up to 1,850 ft. Training your dog in the park, backyard or anywhere else. During the control range, you can use the remote to training it. ★【100% Waterproof】 -100% waterproof collar and strap can be used in shower, swimming pool and the rain. It will work well even when it soaked in water. ★【Adjustable strap and Rechargeable collar】-The adjustable size can modify from 3.9 inches to 19.3 inches. 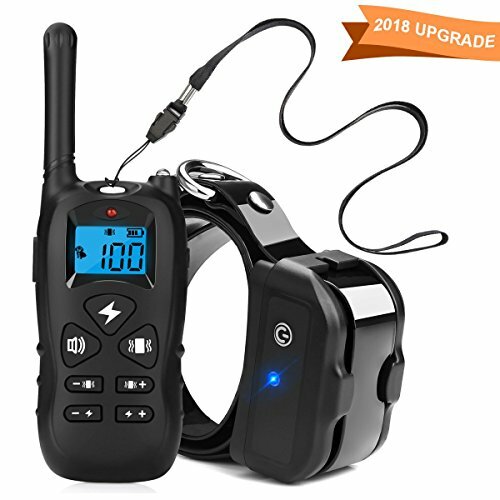 The receiver collar and transmitter are all rechargeable together at a time. We offers 3 YEARS Replacement or Refund Warranty. If you have any questions about this product by Casifor, contact us by completing and submitting the form below. If you are looking for a specif part number, please include it with your message.